A family were left traumatised after a 4ft blade broke from a wind turbine in the grounds of a Rowley Regis school and spun out of control narrowly missing their house. Mother-of-two Emma Brewin estimated the three propeller blades had been spinning at speeds of more than 160mph on top of the huge turbine during Tuesday’s strong winds before they broke off. Suddenly, there was a loud bang and she saw something “flying through the air” out of the corner of her eye. 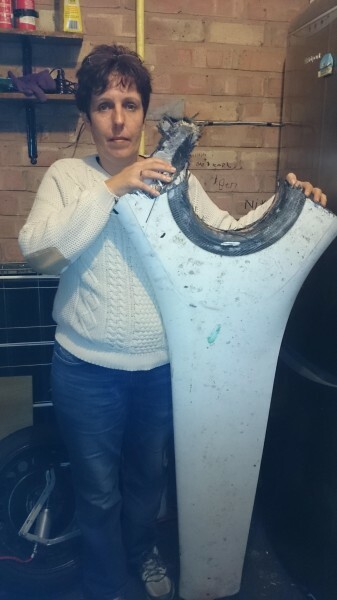 She and partner Steve McGilligan, aged 49, were horrified to discover one of the heavy fibreglass blades had hurtled about 200 yards into their garden, sliced through a hedge and smashed into their next door neighbour’s bench before coming to rest in the garden. Miss Brewin, whose daughter Jayde, aged 18, was out at the time, said her special needs daughter, Freya, aged 11, was particularly traumatised by the incident. “If the propeller had broken off a second later it would have travelled in a straight line and smashed into our living room. We could have been killed,” said 40-year-old Miss Brewin. The wind turbine has caused annoyance to residents, whose homes back onto St Michael’s CE High School, since it was installed to make electricity for the new Rowley Learning Campus two years ago. Miss Brewin condemned it as a “noisy eyesore” which sent a reflected strobe effect into her living room when caught by sunlight. She described Tuesday’s incident as “unbelievable” and vowed to fight through the courts, if necessary, to prevent the wind turbine being put back. St Michael’s CE High School headteacher Mike Wilkes said: “I am really disappointed that the failure of the turbine has caused distress to our near neighbours. A spokesman for Sandwell Futures, which owns the wind turbine, said an immediate investigation had been launched to establish why the blades failed during the strong winds as the area was hit by the tail end of Hurricane Gonzalo. He added: “Fortunately no one was injured, but it was clearly distressing for those affected, and it’s important that we get to the bottom of how this happened.